Halfway Over The Hill: Chunder Buns! As the weather starts to warm up a tad and the rain abates, suddenly there is a flurry of cleaning up to be done around the place. On little properties people are gathering up fallen branches and old wood and tossing them onto the ever increasing bonfire piles. We have a month before the firebans come in, so there are plumes of smoke everywhere. 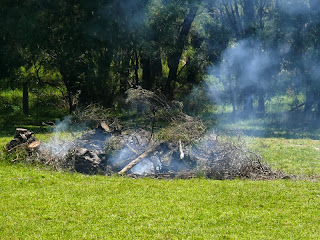 We have 7 huge stumps that we'd love to get rid of, so we've been heaping everything on top to see if they will burn. Finally we had a day with no wind so burning day it was. Everything is still a bit damp so the fire needed persuading to burn fiercely and although all the crap we had cleaned up finally burnt, those stumps stubbornly sat there with barely a scorch mark. We'll have another go in week or so, but this time will stack more small logs at ground level around the stumps, rather than throwing everything over the top. In the vegie patch, we are nearing the end of the winter veggies and it's almost time to clear things up ready for spring planting. 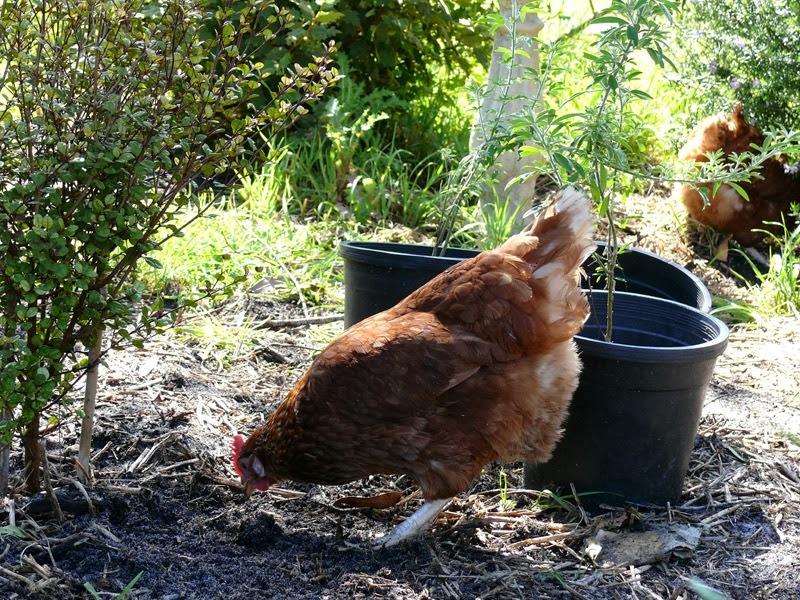 Currently we are eating the last of the broccoli, the carrots are yummy (we should have planted more and will do), the spinach is struggling but giving me enough for a taste (huge problem with slugs this year) and the odd turnip and cauliflower is finding its way into soup or stews. We are about to have an explosion of beetroot and plans are afoot for pickled beetroot and beetroot chutney. The current abundant veggie is celery. We've never grown it before and are very happy with how it has grown. Slugs are a bit of a problem getting between the layers, but a good wash and cut out a few holes and it's fine. 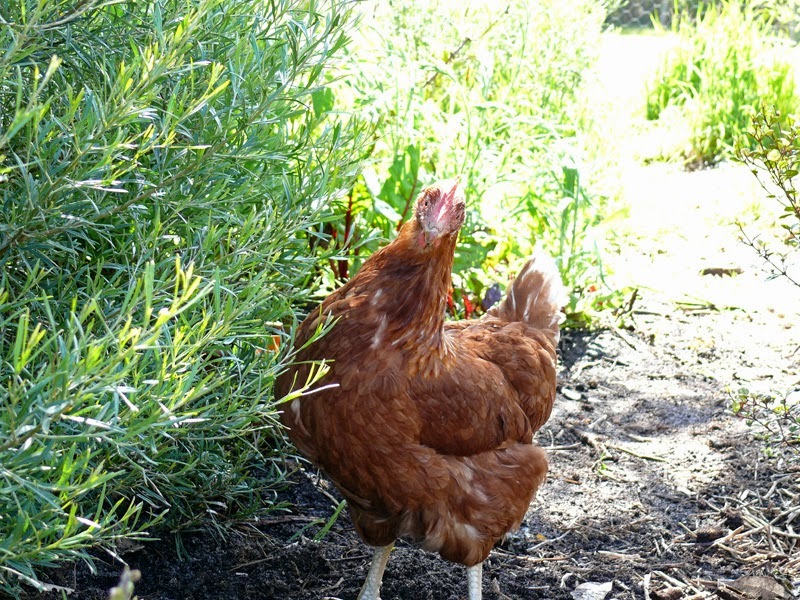 We are looking forward to letting the chooks into the veggie patch before we plant the new stuff, and I reckon they will do a grand job of depleting the slug population! So, with the abundance of celery, we've been adding it to salad and stews. I'm going to cut up, blanch and freeze a heap, a big batch of cream of celery soup is on the cards, then, a brain zap from the past - Chunder Buns! Yes! 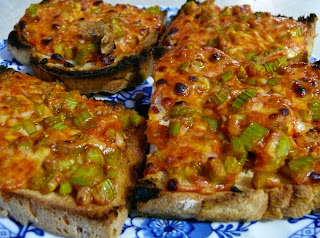 For those of you that haven't tried this delightful snack, grate some cheese, add as much chopped celery as you wish, and mix it together with tomato sauce, enough to moisten the mix and hold it together a bit. Then heap it onto split bread rolls (we used toast this time) and grill until the cheese melts. Yummm! Steve has been busy building me a sturdy fence for my garden. He's finished all the woodwork foundation and has starting adding the wire. 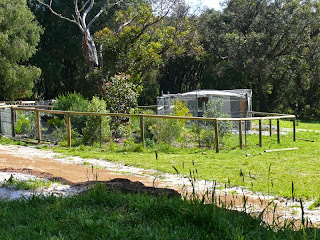 It is supposed to be rabbit-proof wire and the fence is high enough to keep the roos out, I love how it looks. Nothing better than a wooden top to a fence so you can lean on it. 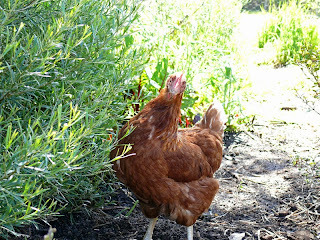 With the nice weather, I've been spending some time weeding and planting in the fenced garden. And my helpers have been doing the same. 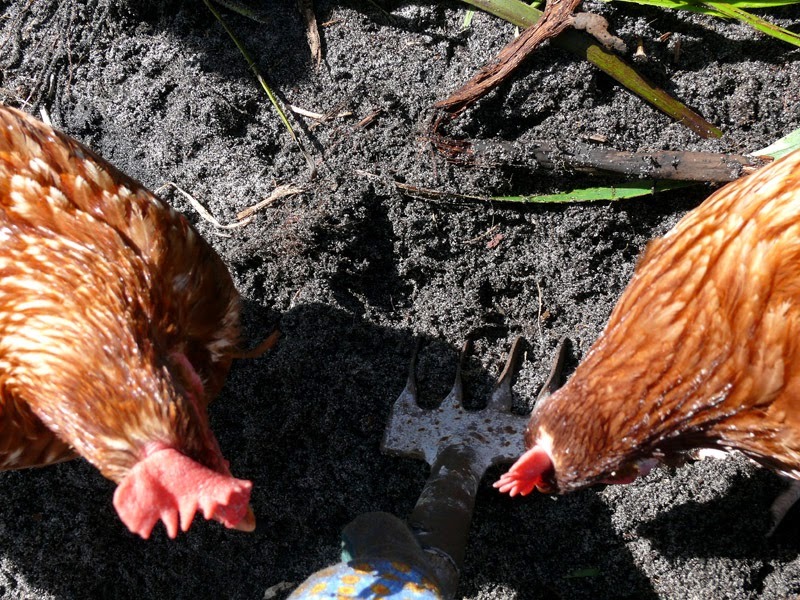 When I say helpers, hmm, it is rather difficult trying to dig holes with a captive audience, ready to dive into said hole at a moment's notice, grabbing worms and bugs. So my digging takes a lot longer but is very entertaining. Here are Angie and Anne watching out for the next tidbit to wiggle. And when the girls are not helping me, they are busy scratching around the plants, feasting on all manner of beasties. Angie even dug up a small, fat frog, which I thought she would ignore. Nope - down the hatch it went!! Yesterday we decided to have a day in town. This time of year Art Trail is on - for two weeks local artists have displays in over seventy locations around Denmark, Albany, Mount Barker and inbetween. 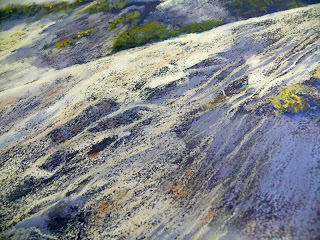 Gosh there are some talented people around and we marveled at paintings, sketches, sculptures, pottery and more. Ever since moving down here we've wanted to buy a piece of original, local art and this year we found it. I can't quite describe the feeling, we both fell in love with this piece and can't stop looking at it. 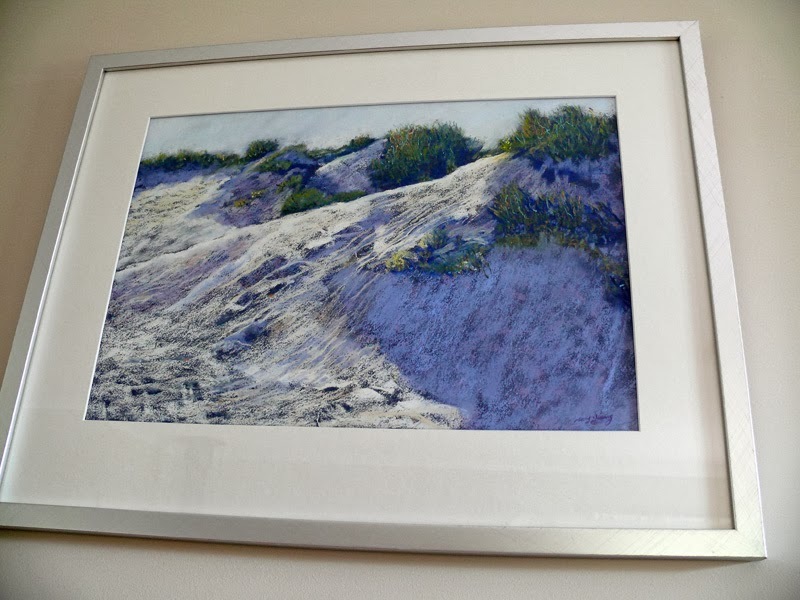 On first glance we thought it was a photograph, but no, in fact the piece has been done with pastels. 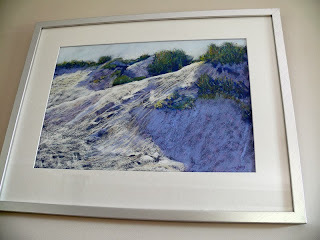 It is called Southern Dune and is the work of a first time exhibitor, a lady by the name of Mary Young. My photo doesn't do it justice at all, the vibrant light captured in it is something that only the eye can appreciate. It isn't purple either, that's the photo! The artwork is amazing - just beautiful. Chunder buns! Did you happen to go to Rossmoyne High School?? These were a favourite at the canteen in the 70s (& possibly much later) & I only remembered them after reading about them on the high school facebook page. ha ha, chunder buns certainly were all the rage back in the seventies when we were teenagers! I lived in Rossmoyne although I didn't go to school there. My husband did however. Small world!